Welcome to Dr. Tim Irwin's assessment tools. To take an assessment, first create a user account. A user account gives you access to free tools that apply the insights from Dr. Irwin's books to your unique personality. 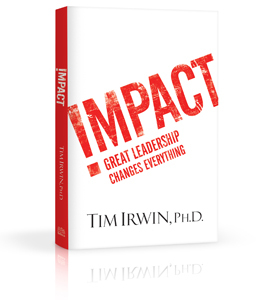 Most leaders want to make an enduring impact – to have a positive and lasting influence on the organizations that they lead and the lives that they touch. Too often, though, leaders fail to achieve the legacy of which they had dreamed. Why do some leaders make an impact, while others falter after their initial success? Why do some leaders endure the challenges and dilemmas that leaders inevitably face, while others succumb to the seduction of power? Interestingly, the answer is rarely "a lack of competence." Instead, most often the answer lies within the "core" of the leader – within his/her character. Derailed chronicles the collapse of six high-profile CEOs, the factors that drove their downfalls, and the lessons that we can learn to avoid derailing our own lives and careers. Thundering hoof beats are headed your way—the events, the circumstances, and the obstacles that are a part of every workplace. Bulls rage around us constantly: inept leaders, unrealistic pressure from senior management, downsizings, misguided compensation systems, outdated IT, and organizational structures that make our jobs difficult or even obsolete—they’re all part of normal organizational life. But don’t take it personally. 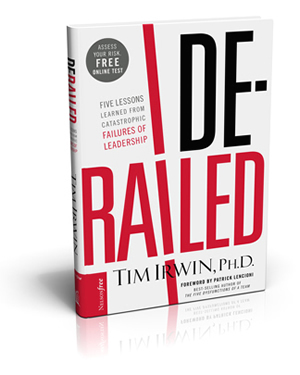 “To view these organizational realities as unfair or out to get us is impracticable and maybe even naïve,” says author Tim Irwin. These organizational bulls are indifferent to us—not caring whether or not we reach our goals but only whether or not they reach theirs. Your organization’s goals are extraordinarily simple and straightforward—survival and success. To not meaningfully contribute to theses goals or even to be irrelevant to the accomplishment of them automatically puts you in harm’s way. If you work, you’re running with the bulls, whether you want to or not. The run requires great wisdom, perspective and forethought—we must develop a strategic mind-set. Dr. Tim Irwin shows you how in Run With the Bulls Without Getting Trampled.